In September, hundreds of AKC affiliated clubs and other dog organizations celebrate AKC Responsible Dog Ownership Day all across the country. Lancaster Kennel Club is one of many dog clubs and rescue groups taking part in AKC Responsible Dog Ownership Day. 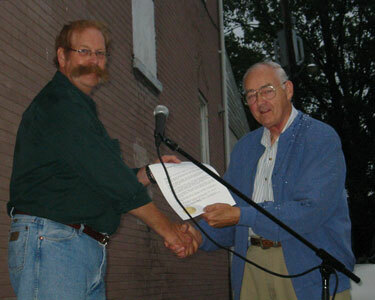 Our 2008 event was in Lititz on September 12th. Despite the continuous rain, there was an good turnout of LKC members and the general public. We micro-chipped several dogs including the Canine Officer from Warwick Township. Breeds in attendance for "Meet the Breeds" included the Wolfhound, Smooth and Longhaired Miniature Dachshund, Cardigan and Pembroke Corgi, Gordon Setter, Standard Poodle, French Bulldog, Yorkshire Terrier, Kerry Blue Terrier, and a Cavalier King Charles Spaniel. There's probably an event near you and you can find it here!